One of the purposes of Intel’s Avoton CPUs is cold storage. ASRock produced the C2750D4I for that need – a mini-ITX motherboard with a 25W eight core CPU, support for 64GB of DRAM, external server management and twelve SATA ports. 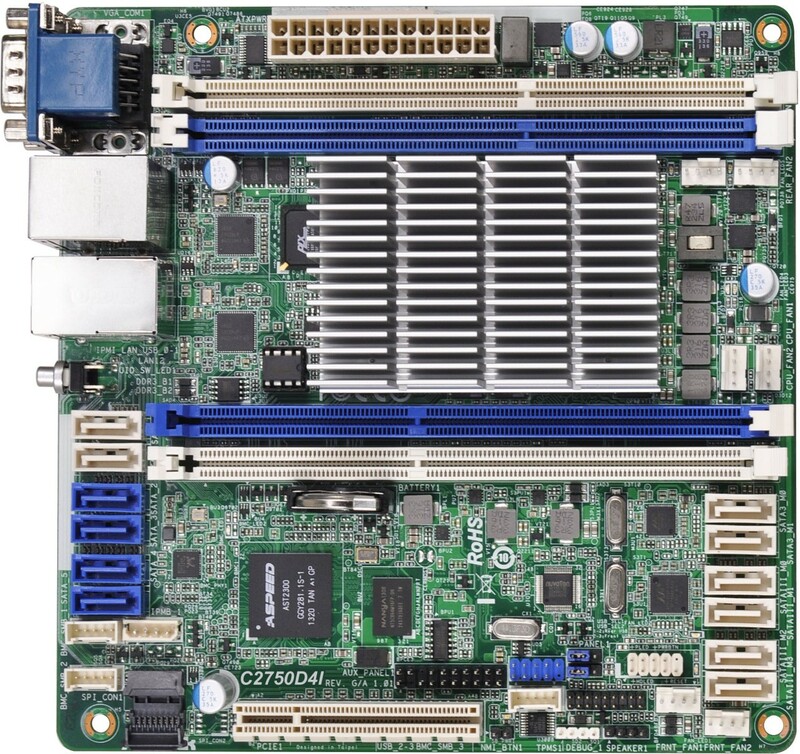 In order to achieve twelve SATA ports, ASRock has equipped the motherboard with additional Marvell controllers. SilverstoneTek has built the DS380 case around this idea. Despite the high price tag for the motherboard($398), there seems to be a buzz around this setup, so ASRock provided one of its C2750D4I 1U servers for review. SilverstoneTek is also in on the action, asking for our opinion of its DS380 case which we will include in this review. There is something about the combination of the phrases ‘mini-ITX’, ‘8-core’, ‘64GB DRAM’, ‘twelve SATA ports’, ‘dual Intel NICs’, ‘server management’ and ‘discrete GPU support’ in combination that almost seems a little unreal. In order to get most of these features, we have to look towards high-end platforms, perhaps even dual socket, where mini-ITX is almost no-where to be seen. In the server market there is more room to maneuver if there is a client demanding hundreds or thousands of units, but those builds typically have custom casing and are not sold to the public. The ASRock C2750D4I then sounds awesome on paper. ASRock’s remit for the C2750D4I is the cold storage solution. The user should be able to combine the system with twelve SATA 6 Gbps drives (24-48+ TB) for infrequent access, or at least a write-once and read-many operation. The eight core solution helps emulation of long-term data conversion tools, with the 64GB DRAM limit (based on when 16GB UDIMMs are on the market, 32GB until then) providing ample room for a RAM-disk or RAM-cache to minimize data across the SATA data paths. The twelve SATA ports are supplied via the chipset (two SATA 6 Gbps, four SATA 3 Gbps), a Marvell SE9172 (two SATA 6 Gbps) controller and a Marvell SE9230 (four SATA 6 Gbps) controller. The three NICs onboard are split between the management NIC (Aspeed AST2300) and two Intel I210s. Despite the passive heatsink used for this 25W processor, ASRock’s server for this motherboard, the 1U12LW-C2750, comes with powerful 14000 RPM Delta fans. Luckily only a small fan is needed for the CPU, but the CPU will overheat without some form of external active cooling. Without POST codes, the use of the management system helped in initializing the platform. As with all motherboards that use tools like the AST2300, the time to POST is 30+ seconds and it might not always be clear if there is an issue. The management software (based on an American Megatrends platform) offers a Java display of the video output, as well as video recording tools that can be enabled if one of the onboard sensors is triggered. The operating software is limited to Marvell’s RAID software. Performance of the 8-core Silvermont-based Avoton is not going to break any records soon. By using many cores and the prevalence of multi-threaded environments (or video conversion tools) is in the C2750’s favor. Daily use is essentially equivalent to the Bay Trail platform, just with it being twice as fast than processors like the J1900 in multithreaded high-intensity workloads. Users buying the C2750D4I are going to be interested in all the buzzwords and have a specific need for most of the feature set. 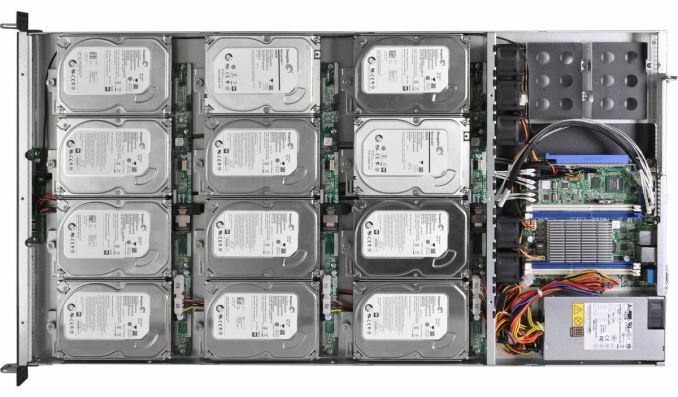 For home users not looking to install a 1U rack at home, options like the SilverstoneTek DS380 exist to make installing at least eight 3.5” drives and four 2.5” drives an easier task for a home storage system. The only issue that surrounds the C2750D4I since its release is the use of Marvell controllers. Users have been reporting that in Linux and FreeBSD, high intensity read/write workloads cause the controller to reset and elements to any software array are lost. It would seem that the C2750D4I is more suited to two/four-drive RAID arrays where each array does not span controllers. In the consumer motherboard lines, four DRAM slots on a mini-ITX motherboard is almost unheard of. The biggest barrier to this is usually the CPU socket, and that the usual orientation for DRAM slots is from the top to the bottom. Because the C2750D4I is a soldered on SoC, ASRock has more determination in the heatsink size, and as the motherboard was designed for a server rack, orienting the DRAM slots from left-to-right helps navigate airflow in confined spaces. There is no 4-pin CPU power connector, and the 24-pin ATX power connector is aligned at the top of the motherboard to aid with cable management. The four fan headers in this area on the motherboard are all located to the right of the CPU and are all 4-pin. The CPU heatsink is pure aluminium but uses tall fins to increase surface area for cooling. Despite this arrangement, as mentioned above, some form of external active cooling is required to stop the system overheating in CPU intensive workloads. The DRAM slots use the single-sided latch mechanisms similar to high end socketed motherboards which means that users should ensure all DIMMs are firmly installed at both ends. The DRAM slot with the wider latch (in blue above the CPU) is marked as DIMM slot number one. The SATA ports are organized such that those in white are SATA 6 Gbps, and those in blue are SATA 3 Gbps. The chipset SATA ports are on the left hand side near the rear IO and the Marvell SATA ports are on the right. Next to these SATA ports on the right are two additional fan headers, again both 4-pin. The C2750D4I also includes a TPM header, and the front panel header is slightly different to a standard consumer front panel as it is engineered for ASRock’s server chassis. The bottom of the motherboard also includes a USB 2.0 header and four BMC headers. If there is one feature that this motherboard is lacking, my guess would be USB 3.0 – there are neither ports nor headers. Above the PCIe 2.0 x8 slot is the Aspeed AST2300 management chip paired with some DRAM. The AST2300 uses an IPMI from American Megatrends for its control via a Realtek RTL8211 gigabit Ethernet port on the rear panel. The AST2300 is actually an ARM9 chip running at 400 MHz, and manages any 2D output via the D-sub/VGA port on the rear IO. The rear panel is fairly bleak, based on ASRock placing all the SATA ports on the left hand side of the motherboard. We have the AST2300 VGA port, a COM port, the management NIC above two USB 2.0 ports and finally the two Intel I210 network ports. The button at the end is actually an LED toggle such that an engineer can find the system in a server rack. This LED can be controlled via the management software. The rear panel on the 1U12LW-C2750 rack case gives suitable holes for all these parts, and as shown the power supply is to the left of the motherboard. The chipset diagram gives an interesting paradigm to consider. ASRock is using a PLX 8608 PCIe switch (an x4 to 4 x1 slots) in order to have enough controller based end-points to go around (many thanks to user bombshelter in the comments for this clarification). This chip shares the Marvell 8172 (dual SATA 6 Gbps ports), the two Intel I210 NICs and the Aspeed AST2300 chip. Typically using a PCIe switch if many of these features are used at the same time, there could be peak bandwidth issues, but as the total bandwidth going in is the same as going out, this should not be an issue. Given the aim of the platform is cold storage, I can imagine the peak usage being a stream coming through each of the NICs and writing to drives on the Marvell 9172 chip. Similar to how a PLX8747 works, one would assume that most of this data could bypass the CPU entirely and be offloaded via the PLX8608. So while the C2750D4I has many interesting features, perhaps describing what is missing is more telling. Ideally we would have USB 3.0 on board, either via a header or ports on the rear. There is also no audio, meaning that home users who want to double purpose the system as a NAS/HTPC will have to invest in a USB DAC and a USB hub (assuming two ports are needed for a USB mouse and keyboard), or a GPU and pass audio through the HDMI port. For $400 you could put together a better HTPC/NAS combo solution with an AMD AM1 ITX system and an Areca SAS RAID card in a PCIe slot. You'd get a superior onboard GPU with HDMI, native USB 3.0, and a better RAID card, not some Marvell crap. You don't have to buy the overpriced octa core board, but could buy the identical quad core version ASRock C2550D4I for $280. Your mainboard doesn't support ECC RAM and your SAS Controller only supports 8 SATA drives without further expanders. Together with the two SATA connectors on the mainboard you got only 10. The quad core has an even lower TDP of 14W vs. 20W of the octa version. The C2750 has a faster CPU compared to your Athlon 5350.